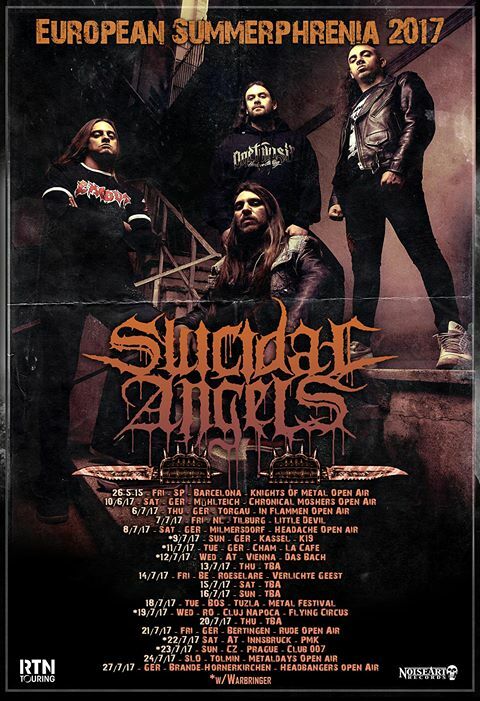 Suicidal Angels enter for their 7th Studio Album and announce massice European Tour !! Written by Suicidal Angels HQ on 01 June 2018 . Τhis day today, beginning of the month, finds us with 2 really nice announcements, with you to share! First of all, on the end of August, we start the recordings of our 7th full length studio album. We are absolutely thrilled to enter the studio for one more time, sharing our music with all you crazy people out there! Stay tuned, more details are to follow in the next days, like recording studio, mixing studio, album title, tracklisting, release period etc! Gladly, we also re...ceived the news that we are going to be part of the MTV Headbangers Ball tour of 2018, on the beginning of the upcoming December! 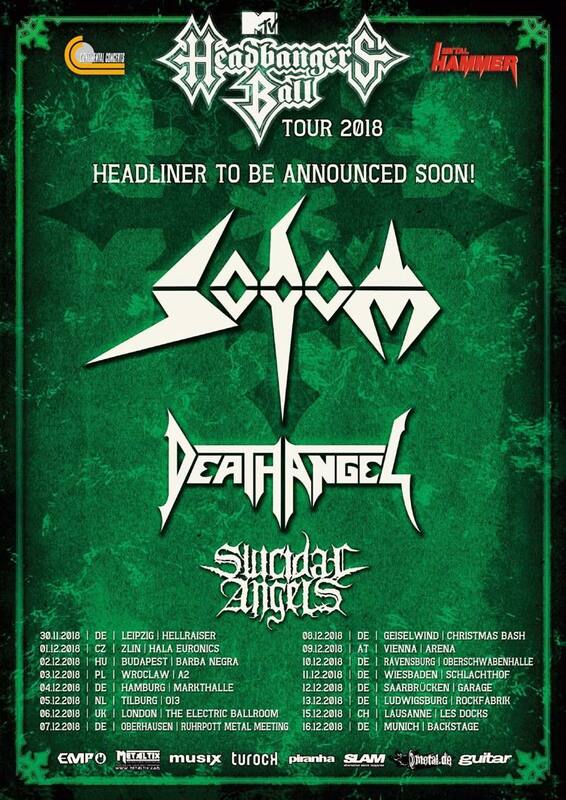 Along with Sodom, Death Angel and a surprise headlining band, which will be soon announced, we join forces to spread the thrash metal mayhem all over central Europe! - "Here we go again, sharing some wonderful news with all of you! There could be no better way than this to end the Division of Blood era and head to a new album! The perfect way to end this year and the perfect line up for an absolute thrash metal mayhem! Wait till the announcement of the 4th band, ha! It’s gonna be killer!!" Keep your eyes and ears open everybody, as links for tickets, plus the headlining band are to follow! DO NOT miss this by any chance!!! SUICIDAL ANGELS on FULL METAL CRUISE !! Written by Suicidal Angels HQ on 27 March 2018 . While being on tour, we receive some exciting news concerning our future concerts. 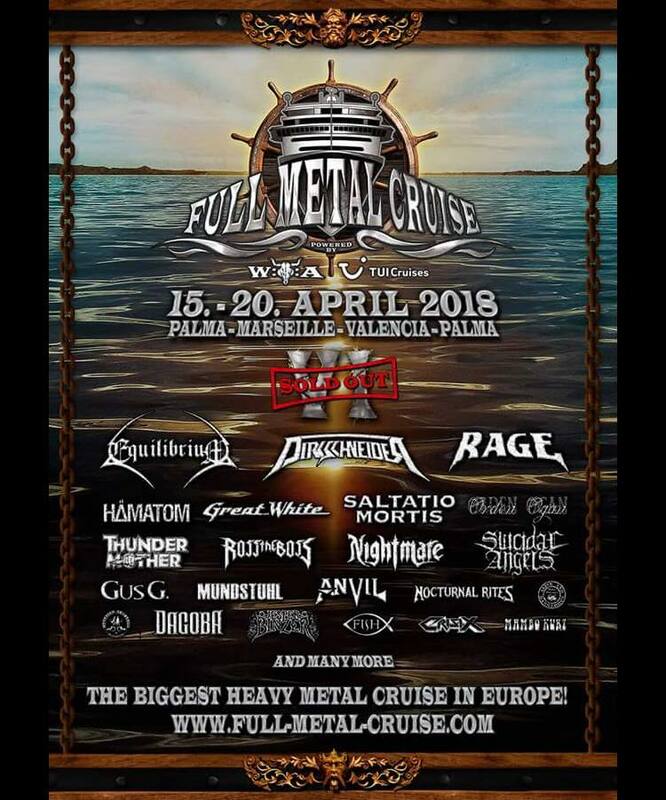 We are proud to announce that we will be on the billing of this years’ Full Metal Cruise! Below you may find the poster and some useful information on it! Totally excited, let’s do this! See you all cruise maniax really soon!!! Written by Suicidal Angels HQ on 29 January 2018 . 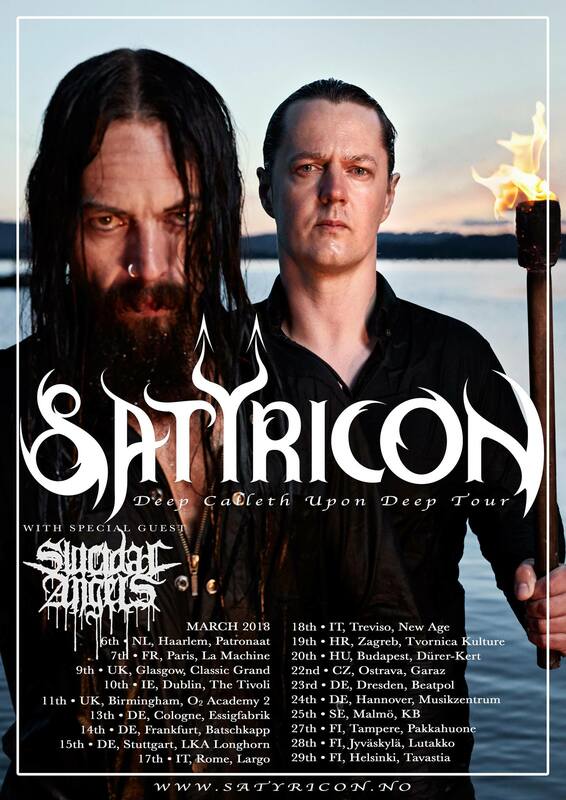 We are excited to announce that we are going to be part of the upcoming 2nd leg of the Satyricon "Deep Calleth upon Deep" tour, starting on the first days of March. This will be our last European tour for the “Division of Blood” album, so in case you missed us in the previous ones, now is your chance! Make sure you grab your tickets and join us to raise some hell! Some additional information. The already announced and confirmed show in Seville on the 10th of March, is still on, so on the 10th instead of Dublin, we will be at the Palacio Metal Fest. Stay tuned, more to come within the next days. "ONE TWO SIX" CLOTHING ENDORSEMENT IS NOW OFFICIAL!! Written by Suicidal Angels HQ on 08 August 2017 . 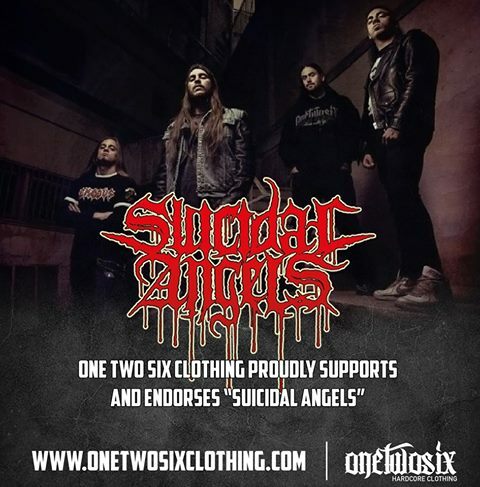 SUICIDAL ANGELS are proud to announce the collaboration with "One Two Six" Harcore Clothing !! Written by Suicidal Angels HQ on 28 July 2017 . Yesterday was the last show of our European summer tour! 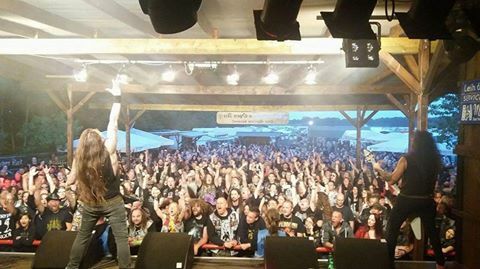 It finished on the best way possible, at Headbangers Open Air Festival, a great festival with cool people in the production and a friendly and warm old school atmosphere! We would like to thank all the bands that we shared the stage with on this tour, also the guys from the Warbringer for a really cool, friendly cooperation and also killer on stage and last but not least, our crew Bob Briessinck, Makis Criss Kyrkos and the local crew, because without them nothing of what happened would have been possible. Cheers to you all out there, thank you very much for your support, keep the flame alive and we will see you all again this September/October! European Summerphrenia 2017 Announcement ! Written by Suicidal Angels HQ on 05 May 2017 . Hey everyone, as summer gets closer, we turn the heat already up! Below you may find the poster with all our upcoming summer appearances, both club shows and festivals. This time, at some of the club shows we share the stage with one of the hottest thrash metal bands from the USA, the mighty Warbringer. We are totally on fire and definitely looking forward to this!! Take a close look at the dates, find which fits you best and join us for the ultimate Summerphrenia 2017!